Don’t miss the Craftsy Memorial Day Sale! 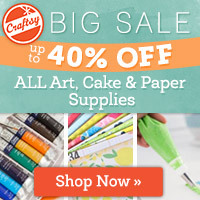 You will save up to 40% off all art, cake and paper supplies! Get everything you need for success – no matter your craft. Explore the nice selection of supplies and take advantage of the best brands at incredible prices. This special pricing is valid through 5/25/2015.